Pervasive. I grew up in the Midwest and weather was pervasive. If it was raining in town, then it was raining in the country. If it was snowy in Milburg, then it was snowy in Stevensville. If it was sunny in Dowagiac, then it was sunny in Coloma. I still find myself amazed at Maui's micro climates. This morning I saw dark clouds and rain a few miles away in Wailuku and yet I knew that it would continue sunny and hot in Kihei. 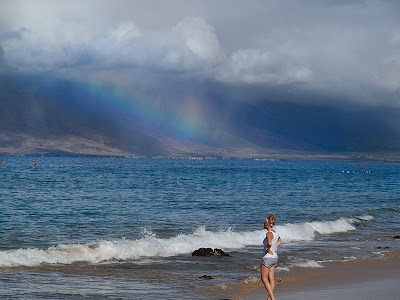 I have driven into town when it was raining heavily in Makena, only to find it clear and dry in Kihei; and upon my return a couple of hours later it would still be raining in Makena. And the dividing line between wet and dry would not have moved! Remarkable. I still slip into the old mentality when it is raining at home to think that it must be raining everywhere. Yet a short drive can always bring me to someplace warm and dry, or cold and dry, or cold and wet, or . . .